Near Pins: Geoff Parker, Alan Harris, Colin Greig, Neil Jones. Our two-ball better-ball game of the month was held at the Bangpra course. Some very good scores were recorded despite the frustration of slow play and the inability of anyone to gain any momentum. Keith Norman teamed up with Alan Harris to take the honors with forty-six points. Second place went to Ronnie Melvin and John Hughes on count-back from Geoff Parker and Gordon Melia. Later it was discovered that Ronnie Melville had played off an incorrect handicap, an oversight of the new rules where overseas-based players with a big differential between their home handicap and PSC should play off their home handicap plus ten percent, a little fine tuning of handicaps may need to be implemented. Near Pins: Gary Smith, Richard Mohan, Ian Rattray, Pat Ryan. Following the cancellation of the previous week’s round at King Naga due to a lack of caddies a new booking today resulted in much the same result, not enough caddies or golf carts and those who went without a caddie had to do with a very shabby pull cart. It seems some lessons are hard to learn. The fairways and greens were in fair condition but off the fairways a decent lie was hard to find. The course would benefit greatly from use of a leaf blower. For a variety of reasons there was a high level of fatigue amongst many of our members after the round, with a number of prize winners not returning to the M Club to collect their winnings thereby benefiting the delinquents fund greatly. Winner of the round was Ian Rattray, in his last game of this term, with an excellent thirty-nine points. Neil Hurst and Stan Stoker were second and third on count back with thirty-six points. Fourth and fifth went to Gary Smith and Pat Ryan also on count back with thirty-five points and Neil Carter filled sixth place with thirty-four. 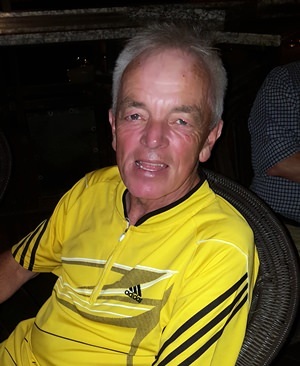 As well as the near pins two additional prizes were also awarded, a golf cap signed by Darren Clark went to Ian Rattray for best score of the day, while the “Bradman” prize for highest score of the round went to Neil Jones (a pair of golf slippers). Near Pins: Led Cobban (2), Neil Carter (2). A smaller than normal group of fourteen made their way to the challenging Treasure Hill course for the last round of the week. As always the course was in fine condition, and playing conditions were benign. Once again slow play was an issue and most residents are now looking forward to low season with less crowded courses and better pace of play. Enjoying some of the best form of his golfing career, Richard Baldotto took the honours today with a fine round of thirty-six points. Many are asking if this run of good form will ever end? Second place went to the consistent Led Cobban with thirty-four, whilst Geoff Cox rounded out the winners list in third place with thirty-three. The ever-present issue of slow play continues to dog the game of golf and some players simply fail to grasp how slow they are. While everyone should enjoy the game, slow play prevents many from having much enjoyment, all golfers should make a conscious effort to play at a respectable pace.